Books Anonymous: Oooooh - journals!!! 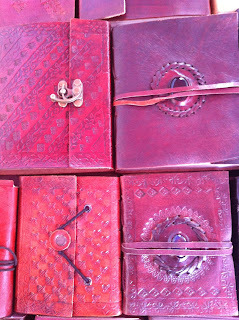 Remember when I wrote that post about my mother's books, and I wrote about her huge collection of notebooks? I have them all stashed in a box in the top of the wardrobe, apart from the tiny wee one I carry in my handbag. I'm a bit of a sucker for small blank notebooks myself - and I'm blaming it on heredity. Well, this afternoon, my Knitting Buddy and I were at the Bondi Markets to collect a prior purchase (that's quite another story!) so we had a lovely wander around the stalls. I was distracted by one that had a big box of leather bound notebooks with a sale sign on it...are we surprised? Of course not! KB was fairly vocal in her efforts to remind me that I'd already done enough spending for one afternoon, and that she's been briefed to remind me frequently when we're out to think before indulging in a shopping free for all...so I reined myself in - comforting myself with the fact that I do actually have a baby leather notebook that I believe may have come from these same people - it lives in the miniature leather satchel I carry as a handbag, which was a gift from Sixteen a while back. Anyway, have a look at the lovely display - there are big books and little books, photo albums and sketch books - all bound in lovely soft leather that fastens with elastic straps or long leather thonging that you tie. They're beautifully tactile, and - seriously - when you pick one up, it's very hard to put it down again! They're just lovely. The problem for me is that an object can't just be functional, it has to be aesthetically pleasing too - and these are! However, I do have my baby one in my bag, and that will have to be enough for the time being. You were right - I would have loved it. 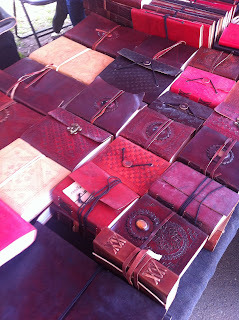 I've got a passion for finding just the right journal. I put so much of myself into each one it has to be just right. Today I had to take what I could get but it wasn't bad. It was fun! And these are very cool. However, I've noticed that there is a much more diverse range of notebooks in even the most ordinary shops these days, so that's good for those of us who need something beyond a lined exercise book!